I love games that break down conventions to their basic elements and make something new out of them. Joining the ranks of Karoshi 2.0 and Braid is Jumpman, a new game by Andrew McClure that’s been making the rounds lately. It’s got mechanics and aesthetics from the Atari 2600 era, but it’s modern under the hood. I’m not sure if I can succeed, but I’ll try discussing what makes this game interesting. The game has a lot of mechanics that we’ve seen before. Rotating the world showed up in “And Yet it Moves,” color-based “dimension shifting” could be found in an area of Within a Deep Forest, and there have been many masocore/really-hard-but-not-punishing games, with the most famous being I Wanna Be the Guy! What Jumpman does, though, is incorporate all of these elements, as well as a few I haven’t seen before, like the visual representation of the classic “wrapping world” phenomenon that you see above. I find it really hard to evaluate and analyze games like Jumpman. The work is necessarily derivative; it’s full of mechanical references to old games and clever twists that are only clever because they violate the accepted platforming conventions. This is the proverbial trick you can only do once; the game’s uniqueness depends on its innovation. Yes, it has a great graphical style, and it’s fun, but what’s notable about it is the way it turns platforming on its head (sometimes literally). A hypothetical Jumpman 2 wouldn’t have the same appeal unless it screwed with the conventions of the first game as much as the first game screws with everyone else. One last interesting thing about the game: its controls. Tons of people have complained about them, talking about “slippery floors” and such. I don’t think that’s what’s actually happening here. The game violates your expectations on how your controls work, which has confused folks. As far as I can tell, holding down the left arrow key applies constant acceleration to the player character, instead of constant speed as people expect. 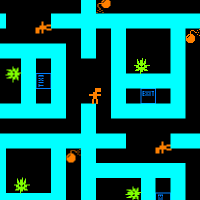 To stop, the player must either hit a wall or brake with the right arrow key. This lets the player build up great speed if she needs to, but makes stopping tricky, giving the “icy floor” feeling. I found it frustrating myself. The interactivity theorist in me wants to credit McClure for finding yet another way to mess with the player’s perceptions, while the game player in me thinks he should have made a more playable platforming engine. Regardless, check the game out. It’s well-done, clever, fun, and it comes with a level editor. I played the game and then read through your article. The main problem I have with games trying to “do what art (sometimes) does” by violating rules and conventions is that games are all about function. When designers go in and change things just for the heck of it, the product usually greatly suffers for it. After all, function is based on usability not subjectivity and/or expression. From what I gather, you equate Jumpman to a riddle or a low quality joke; ie. once you know the answer/punch line, it doesn’t have the same impact anymore. I tend to think of Jumpman as simple and loose with a lot of interesting yet unsubstantial tricks. You say the game turns platforming on its head. I’m not sure how. You jump around to get to the goal. You can rotate levels for some level transformation due to gravity and the changing state of the platforms/walls. There’s a bomb switch that also messes with the levels. Throw in a pinch of interplay (using the ball to crush enemies) and you have Jumpman. I found a few levels to provide interesting puzzles/challenges, and the rest to be less focused. Personally, I don’t put a lot of value in people/products that want to “mess” with me just because. Besides the game elements, the “icy” controls don’t match the level design. Accelerating to high speeds by holding down the arrow key is a very extreme and (from my experience) unnecessary way to move around. To makes things worse (ie. less playable) there’s no short jump (a quality of direct JUMP mechanics), and the game world isn’t quantified to the player movement. For these reasons, the gameplay doesn’t fit/come together. Also, the hit boxes for the enemies/player/goals/”lava” are very loose. The way the game uses physics is also very loose. The only way to interact with the blocks/balls/enemies in some levels is to rotate the level. When you’re trying to clear a path or destroy an enemies to reach the goal, manipulating the level using the rotation is about as effective as trying to shake only red Skittles out of a bag of Skittles. You shake, the physics do what they do, and you hope for the best. If you don’t get your desired result, you try again. This design can easily lead into instances of trial and error/static space. The game reminds me of Flywrench for many reasons. They’re both platformers, similar graphical styles, easy/fast deaths, and fast restarts. While Flrywrench is highly polished/tuned, Jumpman is not. Richard: I don’t think the game is trying to “mess” with you. The tricks it pulls are sort of the gameplay version of puns; it takes the conventions of the genre and extends them, leading to things like the wrapping levels and the rotational mechanics. I agree that the controls are an issue with the game. They’re just not usable enough for the modern gamer. Oddly, a newcomer to platforming would probably have an easier time with them, since she’d have to “unlearn” less… but without the practice of tens of platforming games, she wouldn’t be good enough to surpass some of “Jumpman’s” more difficult levels. I do find the game very well-done, though. It’s certainly not the best example of platforming gameplay out there, and the levels are occasionally more trial-and-error than skill tests. But the game takes a premise and carries it through. It takes a set of “what ifs” and puts them together in various combinations. “What if levels actually wrapped like that?” “What if you could break away parts of the level?” “What if you could do both?” It’s a sort of experiment, and I think it successfully explores the options. It’s not the most usable game, but I did have a lot of fun with it, and it provides great unity of theme. All the elements in the game fit together to make a sort of retro, psychedelic, slightly clumsy work. At least, that’s how I see it. Really, the acceleration movement is more suited for analog controls. Because the game is played on a keyboard, there’s a mismatch in the design. If I had an analog stick, it would be much easy to control the character like it is in Monkey Ball. I just got through level 9 (or was it 8) and I see what you mean. The last “world” or so was pretty interesting even though the game has camera and control issues. The “theme and variation” (ie. the “what ifs” and “various combinations”) is pretty thorough. There are a lot of levels that use each new mechanic before introducing a new one. I like that classic approach. I agree. The game is neat and fairly well done. Thanks for mentioning this game. I loved it. I don’t see why people are complaining about the controls; they seem to be just a part of the game to me. There are a few levels that were frustrating for a while, but usually I could figure out a way to do them without too much trouble eventually. I haven’t really played around with tessellation tricks yet, though, and I look forward to it. Finally beaten. Great game, really. Controls are not bad, they are just part of the gameplay. Nice thing is that the game is hard (and satisfying), but not frustrating (even though few levels were really hard). There are plenty of levels, but each of them is different (and each set, called “path” is totally different). I love the path with different colors and brushes. Generally speaking, the game is fresh and full of “what if” ideas that noone treated serious. Just like it would be 10-year old boy with his head full of ideas who would never be taken seriously, grown up and made his game. Really creative. Sorry for my English, I hope you can understand, what I meant :-).